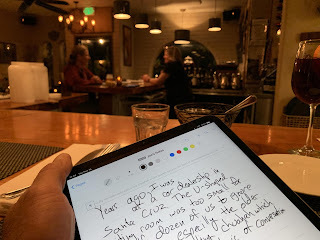 Drafting this blog post with handwriting recognition software. Years ago, I was at a car dealership in Santa Cruz. The U-shaped waiting room was too tiny for the half a dozen of us to ignore each other, especilly the older lady with a chuahah which quickly became the center of conversation for all of us. The cuteness of her dog was a natural draw for people; doubly so for little kids due to its smallness. The lady said that little kids could sometimes be a bit too rough with her dog and quickly overwhelm it. But, she pointed out that she came up with an ideal solution. She taught the dog to growl on the command “ferocious” and then she demonstrated. "Excuse me, is your dog friendly? Can I pet him?" she said kids would ask her. "Be careful, he is ferocious," she’d respond. As she told us this story, the dog showed his teeth and let out a growl fiercer than his size. We all roared with laughter. She then said, "Growl," a couple more times, and each time, the dog let out a highly convincing growl. Impressive and effective.